AP Sodhana Public Charitable Trust has furnished 7 days residential training programme to 20 Govt AP Sodhana Activity Based Training Schedule District wise Dates Scheduled Dates/Model Primary School teachers from both Virianagaram and Visakhapatnam Districts The following schedule for conducting training on Sodhana Activity Based Training Master Coaches for remaining districts 20 Govt Model Primary School teachers from both Virianagaram and Visakhapatnam Districts. Sodhana Public Charitable Trust Chipurupall lst an 2nd Standards Trainin to 20 Class I & II Teacher of Model Schools per district of Zone -I & II Training programme Scheduled. Email dated: 02.04.2018 of P Kamaswara Rao, M/s Sodhana - Public Charitable Trust, Chipurupally, Vijayanagaram. The attention of the Regional Joint Director of School Education, Kakinada and District Educational Officers of Srikakulam, East Godavari, West Godavari and Krishna districts are invited to the references read above, where in Sri. P Kameshwara Rao M/s Sodhana Public Charitable Trust, Chipurupally, Vijayanagaram in the reference 20th read above, has informed that they have sucessfully completed 7 days residential training programme to 20 Govt Model Primary School teachers from both Virianagaram and Visakhapatnam Districts. 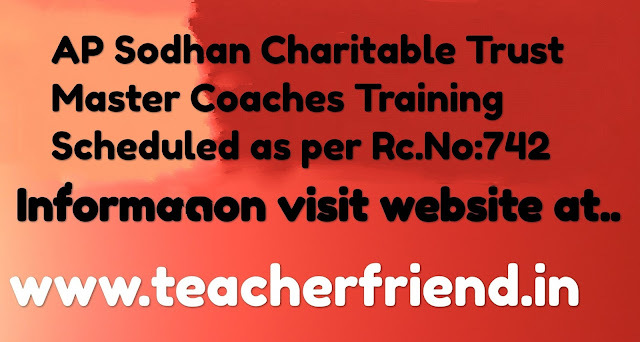 They are informed that M/s Sodhana Public Charitable Trust has furnished the following schedule for conducting training on Sodhana Activity Based Training Learning Model for School Education as Master Coaches for remaining districts. Sodhana Activity Based Training Schedule District wise Dates. Virianagararn two days before through Email (pdkrao@hotmail.com)to make necessary arrangements at the venue.